Have you ever wondered what William Shakespeare would write if he lived in the modern era? What if he wrote one of the modern pop culture classics, like Star Wars: A New Hope? The folks at Quirk Books have pondered these questions and released William Shakespeare’s Star Wars to answer them. I am a fan of Quirk Books unusual sensibilities. Adding zombies to Pride and Prejudice to create Pride and Prejudice and Zombies or robots to Anna Karenina to create Android Karenina. These unusual pairings make the Reese’s Peanut Butter Cups of books – two great tastes that taste great together. The appeal of these unexpected pairings was apparent from the first book and continues through their other novels, giving an unusual look at history and literature. 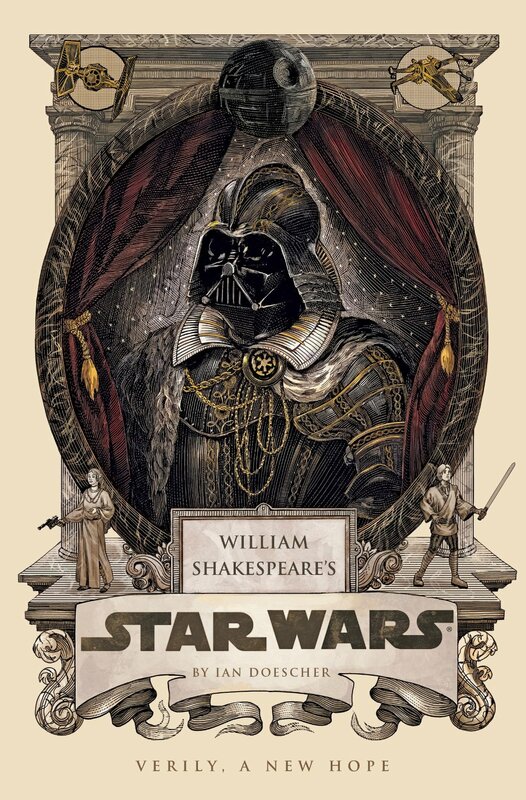 In William Shakespeare’s Star Wars, Ian Doescher acts like a modern day Christopher Marlowe, creating words attributed to the Bard of Avon by way of George Lucas’ plot. While following the story of the original Star Wars film, everything is written is Shakespeare’s style. Predominantly written in the iambic pentameter that he is known for, the characters interact as if they existed in his time. Narration irregularly occurs through a chorus, characters say asides to the audience in scenes, and have the general sensibilities as if they were in the Elizabethan era. Spread through the book are illustrations in a wood cut style by Nicolas Delort, punctuating scenes with reimaginings of the Star Wars universe. Delort takes the Elizabethan style of dress and style and applies them to the characters we all know to create a unique view of characters and scenes we all know intimately. William Shakespeare’s Star Wars is an entertaining reinterpretation of the story we have all been watching for the last 36 years. Subtitled “Verily, A New Hope,” it makes me look forward to the inevitable release of Shakespeare’s version of The Empire Strikes Back. And if anyone decides to put on a performance of William Shakespeare’s Star Wars, I will be sure to be in attendance.